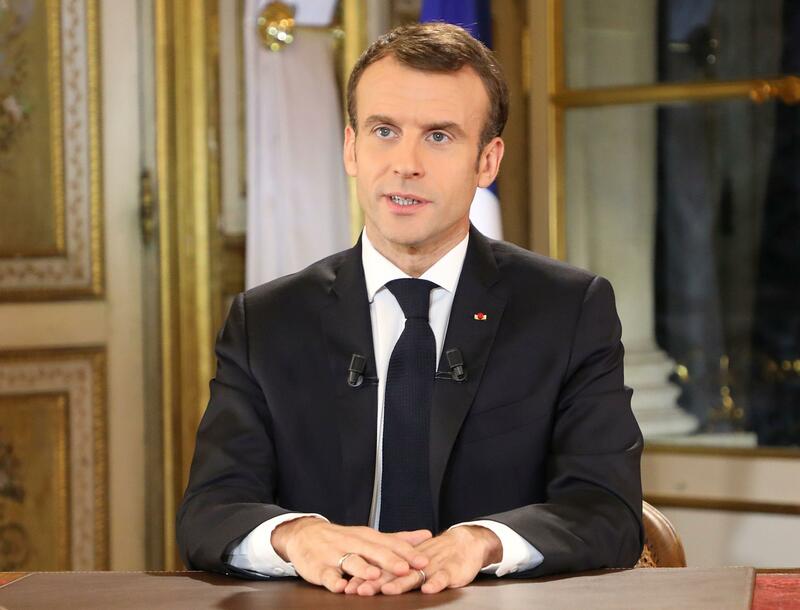 PARIS — President Emmanuel Macron broke his silence Monday on the exceptional protests shaking France and his presidency, promising broad tax relief for struggling workers and pensioners — and acknowledging his own responsibility in fueling the nation's anger. Speaking with a soft voice and gentle tone, Macron pleaded during a brief televised address for a return to calm after almost four weeks of protests that started in neglected provinces to oppose fuel tax increases and progressed to rioting in Paris. "We are at a historic moment for our country," the French leader said from the capital's presidential Elysee Palace. "We will not resume the normal course of our lives" after all that has happened. Protesters spent days demanding that Macron speak publicly about their concerns, but it's unclear whether the responses he offered will be enough to quell the dissatisfaction. Some protest representatives have said more demonstrations will be held Saturday, following the ones in Paris that turned violent during the previous two weekends. Slashing a tax hike on small pensions, acknowledging it was "unjust"
"I take my share of responsibility for the anger gripping France," Macron said, an unusual admission for a president accused of being out-of-touch. "I might have hurt people with my words." However, the centrist leader insisted the protesters' "malaise" is as old as he is — 40 years — and coincides with France struggling in recent decades to keep up with globalization. The president's long silence since the first protests last month aggravated that anger. Many protesters hoped only to hear one thing Monday from Macron: "I quit." Graffiti scrawled throughout the French capital singles Macron out for criticism, reflecting a national sense that the former banker is arrogant and removed from public concerns. But he has appeared out determined to continue trying to make the French economy more competitive globally. Many have been calling for Macron to step down, CBS News correspondent Charlie D'Agata reports. His approval rating has plunged to around 20 percent. Now the students are joining in. The Education Ministry reported disruptions in around 120 schools across the country Monday, including dozens that were blockaded by students. CBS News visited the Université Paris Nanterre, where students blockaded buildings and staged a mass walkout, right in the middle of what would be end-of-term exams. They're protesting education reforms that include a fee hike, particularly for foreign students. They told us it's not only unfair, they fear it will open the door to increased tuition fees for French students. They pulled temporary fencing over doorways, setting off skirmishes with school security guards. It wasn't much of a physical blockade, but it was enough to send the message that the college is closed for business. Finance Minister Bruno Le Maire said new measures should focus on helping France's working classes. The yellow vest protests began in November against a rise in fuel taxes — which Macron retreated from last week — but mushroomed into a plethora of sometimes contradictory demands. Lately, they have included Macron's resignation. "Macron is there for the rich, not for all the French," 68-year-old retiree Jean-Pierre Meunuer said at Saturday's protest in Paris. With the new demonstrations planned Saturday, some police officers who spent multiple weekends on crowd and riot patrol are calling for their own tax-exempt overtime pay. French media reported that 136,000 protesters took to the streets nationwide Saturday.